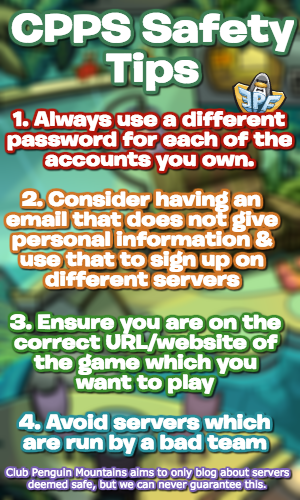 Our Rockhopper Tracker aims to help you meet our local pirate on Club Penguin Rewritten so that you can receive a medium-difficulty and obtain his exclusive background! Rockhopper usually docks on the island every three to four months. When his ship, the Migrator, can be found at the Beach, Rockhopper will be visiting the island. You can also see his ship from the telescope at the Beacon to know when he’s approaching. Rockhopper’s Christmas Giveaway was the background which could be obtained by meeting Rockhopper at the Christmas Party, both in 2017 and 2018. 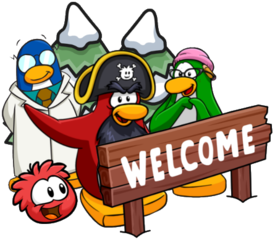 Rockhopper’s third background was available by meeting him during the Waddle on Party in March 2018, for which he visited multiple times for. It was also available when he visited in May 2018. This background was not custom and was available on classic Club Penguin too, but it does look very cool! Rockhopper’s fourth background, which is custom, was available by meeting him during the Island Adventure Party: Rockhopper’s Quest event. It features an island in the background, which was likely one that could have been sailed to in Rockhopper’s Quest. Rockhopper’s fifth background was available by meeting him during the Fair in September 2018. It is also a custom background. Rockhopper’s sixth background was available by meeting him whilst visiting in March 2019. It isn’t a custom background. These are how the backgrounds look like on your playercard. Good luck in meeting Rockhopper soon!